Bull of second generation crossbreeds for the Tauros breeding site in the Danube Delta rewilding area, Romania. 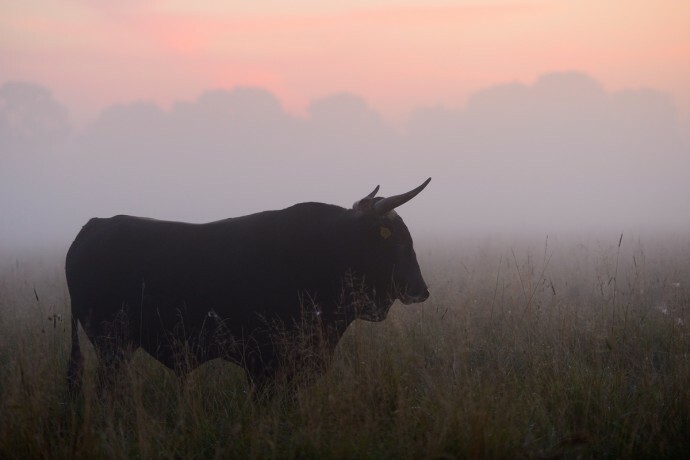 Rewilding Europe and the Taurus Foundation are working together, with a common goal to preserve biodiversity in Europe through a breeding programme aiming to bring back a functional, wild version of the aurochs. Using the closest relatives to the original aurochs the aim is to build up viable wild populations of this impressive animal in several locations in Europe, to take their important role as natural grazers in European landscapes. The two other Tauros breeding sites where Rewilding Europe and Taurus Foundation work together so far are located in Western Iberia (Portugal/Spain) and Velebit Mountains (Croatia). 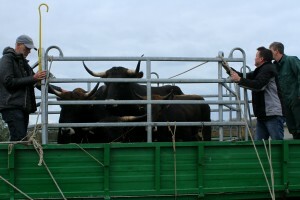 The animals that were transported from a Tauros breeding site in The Netherlands are part of the European Wildlife Bank. Herd contracts were signed with three experienced Romanian cattle breeders: Stefan Crimschi, Andrian Nichifor and Cristinel Ifrim who jointly have grazing rights for 150 hectares of land in Sfântu Gheorghe. This typical little village is situated right at the mouth of the Danube River, where the Sfântu Gheorghe Branch enters the Black Sea. The herd counting twelve individuals will be released into a large open area after an initial stay of 24 days in an enclosure, where they will be monitored and tested for different diseases. In the grazing area, mostly west of the village, they will be part of a natural grazing pilot in the Sfântu Gheorghe communal pasturelands. Natural grazing is all about the return of a key natural process that creates biodiversity rich mosaic landscapes, where wild and semi-wild grazers occur in social herds and in natural densities, ultimately becoming self-sufficient. Sfântu Gheorghe communal pasture is a special wild and unfenced 5,000 ha large area where the local community has the right for animal breeding. Over time, this activity became a traditional occupation and an alternative income source to fishing and tourism in the Danube Delta. Ronald Goderie from the Taurus Foundation opening the gates to release the animals into the enclosure site in Sfântu Gheorghe, Romania. — “Passing through this area, which is a combination of levees and backwaters, one slowly discovers its great biodiversity’’, says Alexandra Panait, Rewilding Europe team leader in the Danube Delta. The already present free-roaming cattle that use narrow paths gradually open up the landscape for other species, like wild boar, golden jackal and rodents. 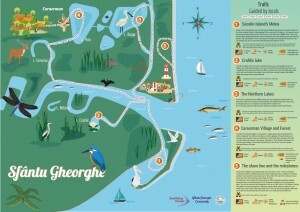 There is also a great diversity of water and marsh birds in the area. The Tauros Programme will enhance the role of the bovine in the area, with the best characteristics of the animals just brought here, the crossbreeds of Sayaguesa, Maremmana, Tudanca, Limia, Pajuna, Alistana-Sanabresa and Maronesa”, Alexandra further explains. — “Large herbivores play a key role in the immense biodiversity of this beautiful area, in particular the dryer parts. It is very special that the potential benefits of the programme are also recognised by the local community”, explains Ronald Goderie from the Taurus Foundation. Ronald travelled to the Danube Delta to meet the cattle after their long and complex transport to ensure a smooth transition. He also met with the herd managers, presented the role of the programme and explained the breeds and best practices used in herd management in depth. 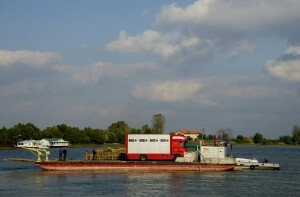 The barge loaded with the lorry transporting the cattle to Sfântu Gheorghe, Romania. The barge loaded with the lorry transporting the cattle travelled from Tulcea, the main entrance to the Danube Delta, 70 km downstream reaching its final destination in Sfântu Gheorghe. After this 7-hour journey interrupted by an overnight 12 hours stop, members of Sfântu Gheorghe local community, herd managers, rewilding team and other conservationists waited for its arrival and assisted with the final part of the transport from the barge to the enclosure. Valentin Sidorencu, Mayor of Sfântu Gheorghe was also present at this important local event, supporting the launch of the breeding site and offering technical help if and when needed. The aurochs is the ancestor of all cattle in the world and thereby the most important animal in the history of mankind. It is also a keystone species for many European ecosystems, but was hunted to its extinction in 1627. However, its DNA is still alive, but distributed among a number of the ancient original cattle breeds. 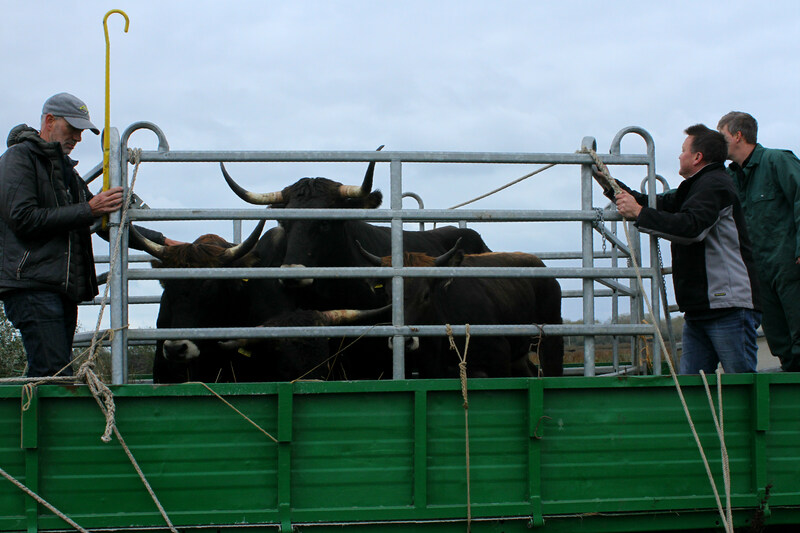 “The Tauros Programme” aims to bring back the aurochs as a functional wild animal, by back-breeding the closest relatives of the original aurochs. Drawing of the aurochs, ancestor of all cattle and the largest and heaviest land mammal in Europe. A wilder Europe really needs herds of fully self-sufficient, wild bovines to prevent further loss of biodiversity. This is why the ”Tauros Programme” was started by the Taurus Foundation, with the goal to bring back the closest possible stand-in (or ‘ecological replacement’) for the extinct aurochs as a wild animal. Rewilding Europe has joined forces with the Taurus Foundation in these efforts. 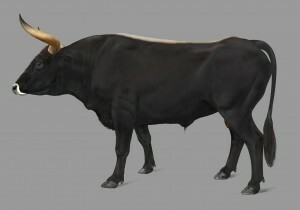 The Tauros – as the animal will initially be called – will resemble the aurochs as closely as technically possible in appearance, ecology, behavior and genetics. The breeding programme is founded on a broad, multidisciplinary scientific base, including geneticists, ecologists, molecular biologists, archaeologists, archaeo-zoologists, historians, isotope experts, cattle experts and European cattle breeding organizations. The final goal of the programme, to be met in some 20 years, is the presence of the Tauros as a self-sufficient wild bovine grazer in herds of at least 150 animals each in several rewilding areas in Europe.